If you aren’t familiar with the idea of second day hair, it’s the day AFTER washing your hair hair. I have never been the wash my hair daily type because my hair is thick and coarse and color treated (dry) so it usually takes a couple days before the grease even shows. My go-to second day hair is usually just flat iron curls or a sock bun. After doing a Pinterest search, I see that I am clearly missing out on some pretty fabulous second day hair ideas. Whatever style you chose I definitely recommend dry shampoo. I have tried a few different brands and my very favorite is Not Your Mother’s Clean Freak Refreshing Dry Shampoo . It doesn’t have much of a smell to it, and its light. Best of all it works great to take the greasy look out of your hair. If you want to go pro, I recommend KMS California Hair Play Makeover Spray . You can buy it at any drugstore next to the shampoo. Some brands make hair feel heavy or have a strong odor, avoid those! You might just need to try a few out to see what you love. I have never been a big fan of it, but a lot of people just use baby powder to take away the grease and it works great for them. This style is so cute and so easy. And bonus! No heat! Perfect second day hair style! I love the messy look of this style and the braid to make it interesting. This is so so easy and so cute. Throw on a fun headband to go with it and you look put together in no time! 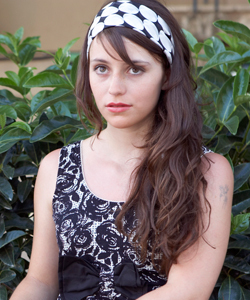 Headbands are a great option if you prefer to keep your hair down but don’t want it to look greasy. Throw in a few curls lose curls to ad some volume and you’re good to go! This is so pretty and surprisingly easy. This is a style you could easily dress up or dress down for an occasion. This entry was posted in Beauty, Hair on February 4, 2013 by Heather.